Home>Blog >Asparagus – a smelly affair? Time for a mini-blog from Dr Michelle…..
Asparagus – a smelly affair? Time for a mini-blog from Dr Michelle….. 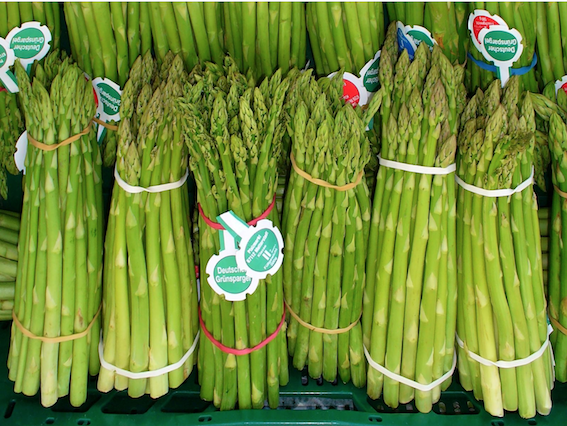 I walked into the supermarket the other day and saw asparagus on the shelves again – I can’t believe it’s that season already here in Switzerland! I love asparagus and with its health benefits, try to eat as much of it as possible when it’s available. But do you notice that your pee smells a bit funny after eating asparagus and wondered what causes this? For everyone, during the digestive process, proteins in asparagus known as sulphurous amino acids break down into chemicals that are passed out in the urine. These chemicals have a distinctive smell and are volatile. That means they become airborne when you pee – their odour wafts upwards making it easy for you to smell them when you go to the toilet. This digestive process and chemical production starts to happen quite quickly after you’ve eaten asparagus – probably within about 15 minutes. So this means that if you go to the toilet between courses at your dinner party and you’ve had an asparagus starter, you may already be able to smell the pungent odour! But here’s a fact – everyone has the ability to produce this odour from their urine after they have eaten asparagus but not everyone has the ability to smell it. It’s only between 25-50% of the population who actually carry the gene that allows them to smell the pungent chemical compounds. So, it’s not a case of whether you produce smelly urine after eating asparagus, it’s a case of whether you carry the gene that gives you the ability to smell it.